Flora Belle Buckman is a self-proclaimed cynic. She lives with her mother, a divorced writer of romance novels, and visits her father on the weekends. She spends her days reading comic books (much to her mother’s chagrin), and it is from these stories that Flora acquired her life motto: “Do not hope; instead, observe.” But you have to admit, hoping is so easy when impossible events are happening every day, particularly when those events involve a squirrel with superpowers. 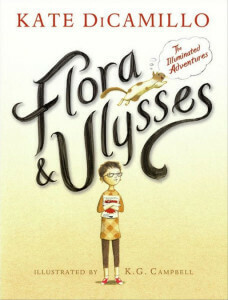 Flora and Ulysses: the Illuminated Adventures has a quality that most children’s literature misses. Kate Dicamillo pays her readers the highest compliment by assuming that they are capable of understanding the depth of human feeling. Like The Tale of Despereaux and The Miraculous Journey of Edward Tulane, DeCamillo has written a book that rings true and echoes real life. With it, she can of touch the hearts of children of all ages. Flora and Ulysses is a special story. It is fun, playful, and spontaneous, but its message is timeless. Cynicism is an empty value that affects an empty lifestyle; the only way to truly experience life is to do so with other people. Yet again, Kate Dicamillo has captured the essence of life and distilled it into a simple children’s story. It is an easy read, perfect for road trip reads or bedtime stories. Parents as well as children can enjoy this book: the sprinkles, quarks, typewriters, and all.